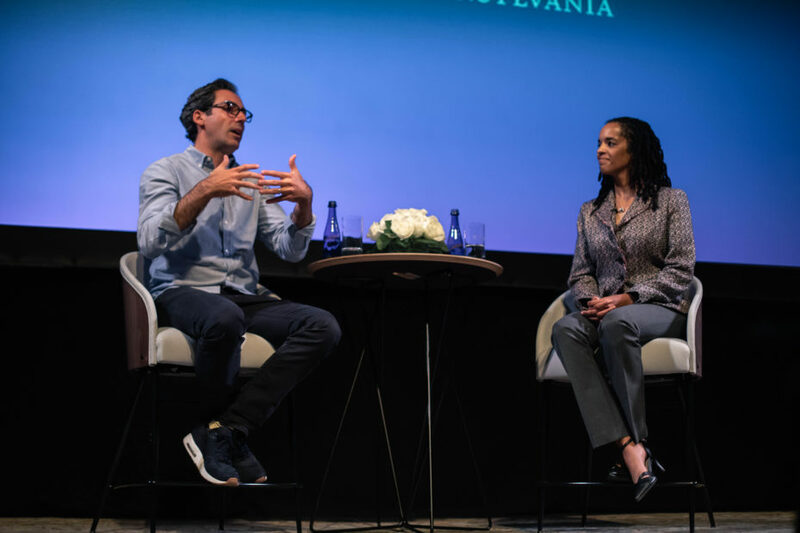 Warby Parker co-CEO and co-founder Neil Blumenthal, WG’10, returned to Wharton Pre-Term for a conversation with Prof. Stephanie Creary about how to build diversity and inclusion. 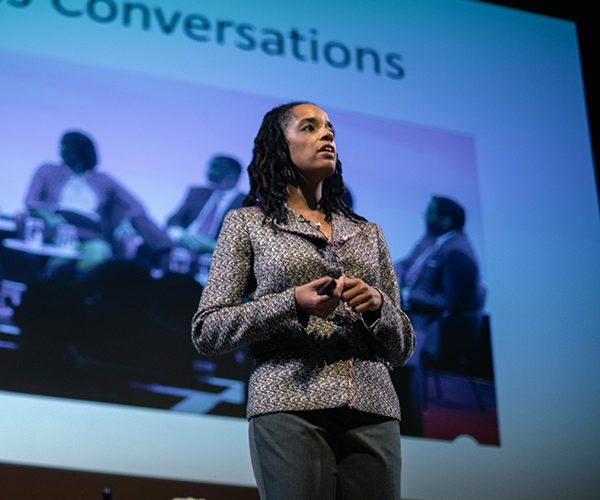 “When we do diversity right, we can be innovative and creative and do great things,” said Prof. Stephanie J. Creary from the stage of Penn’s Annenberg center before an audience of first-year MBA students. The assistant professor of management was introducing Neil Blumenthal, WG’10, the co-founder and co-CEO of eyewear disrupter Warby Parker, for a discussion on his experiences creating and leading an inclusive organization. The August 15 keynote conversation was a new development at this year’s Wharton’s MBA Pre-Term — the intense immersion that introduces first-year students to their learning teams, Advising Support Network, and the Wharton community. Creary and Blumenthal spoke at an evening event that officially capped off Pre-Term and preceded their first MBA class, Management 610: Foundations of Teamwork and Leadership. Organized by the MBA Program Office and the McNulty Leadership Program, the event promoted inclusion in Wharton’s 862-person MBA class, which includes students from 80 countries across the globe. Blumenthal, who founded Warby Parker at Wharton with MBA classmates Andrew Hunt, David Gilboa, and Jeffrey Raider, shared his insights on how they built their innovative company from a Venture Initiation Program startup to an industry disrupter with its own manufacturing lab and retail shops. Here are some takeaways from Blumenthal’s remarks. Create a place for discussion and belonging. Listen to other perspectives to create policies that are inclusive. While he hadn’t considered that perspective, his team changed the meeting time to be more inclusive to parents. Remove bias from recruitment and resume review. Blumenthal gave an example of how often he was given referrals to interns from friends, colleagues, and investors, many of whom share his demographic background. With limited internship slots to fill, he could fill them all by referral, but to find diverse voices, companies have to recruit beyond their own networks. Break down silos to create innovation. “We try to take learnings from different areas of the company and apply them across. There are very few companies that have a tech team, eyewear design, brand design, digital design, store design — all these different functional areas,” said Blumenthal. “Ideas don’t form in isolation. They form from people with different viewpoints,” he said. Inclusion in one area leads to innovation in others. Warby Parker began its diversity and inclusion program after realizing that some transgender employees were being misgendered in their administrative system. By changing their system to be more inclusive to transgender employees, they gained perspective that helped them understand customers. The transgender employees pointed out flaws in gender tagging, and Warby Parker added additional gender responses to improve both customer and employee experience. Start the conversation to start change. Prof. Stephanie Creary invited MBA students to take her seven-week Leading Diversity in Organizations elective, which returns for a second year. She emphasizes that belonging and inclusion are the goal of diversity programs. “Three of the things I’ve learned is that voice, belonging, and respect are core elements of inclusion,” she said.